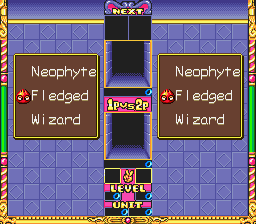 This is a puzzle game where you play as one of two magicians. 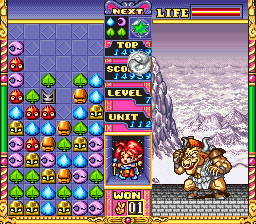 Match blocks to cast spells and attack the enemies. 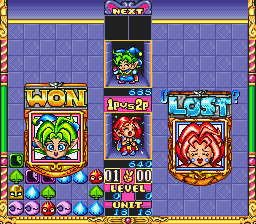 Fairy standard puzzle game, but it has cute graphics and good music. 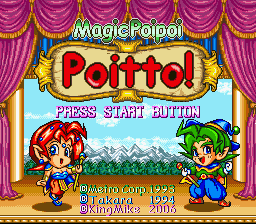 Ported from an arcade game called Poitto. Use D-Pad to choose selections, A to confirm, B to cancel. A, X or R Button: Rotate piece clockwise. B, Y or L Button: Rotate piece counterclockwise. Match 3 pieces horizontally, vertically or diagonally to clear them. Match 4 to cast a spell and attack the opponent. Make a chain reaction to attack with multiple spells. There are two special tiles: Ghosts will disappear after landing. Stars will remove all tiles on the field that match the one it touches. There's probably a special condition to get a star, but I'm not sure what it is. • Monster Mode: Fight all the monsters. 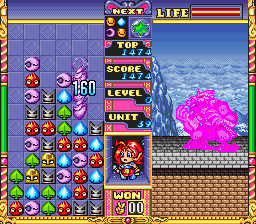 Aggressively make combos and chains to attack the monster. Attacking will raise the floor, continue to attack to reduce it's HP. 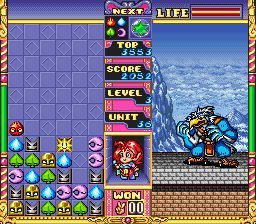 When the monster's HP runs out, you win. But if you are too slow, the monster will recover HP and the floor will drop back down. 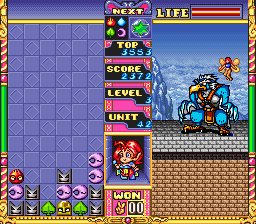 The monster will regularly change your pieces into evil statues, which will interfere with your stack. • VS: Now the Monster will actually be participating rather just be an animation in Monster mode. • Addiction: A 50-stage level-clear mode. 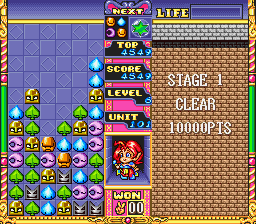 Arrange the vase tiles on each stage to win. 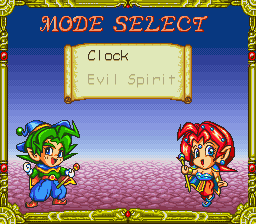 • Clock: When you case a spell on an opponent, it will temporarily lock random tiles on their side. 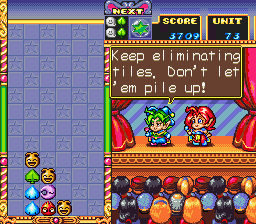 The locked tiles can be dropped, but cannot be removed from play until the timer on them runs out. • Evil Spirit: Like the single-player modes, attacking the opponent will replace random tiles on their side with statue tiles. • Until It Hurts: And endless/practice mode. 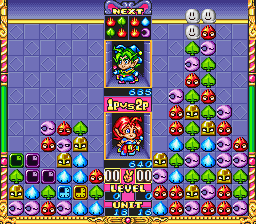 1 or 2 players can play independently. 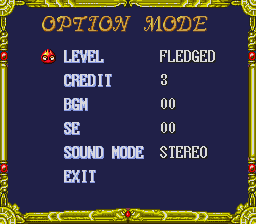 • Options: Choose the difficulty level, number of credits, change the sound mode or listen to a sound test.